ENO Sub6 Hammock. One of the newest additions to ENO's Ultralight Series. 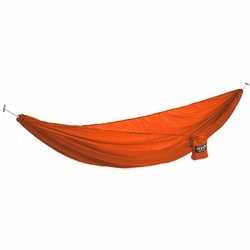 Updated with custom aluminum toggles, these lightweight hammocks shave weight, but not comfort. Constructed with ripstop nylon, stronger-than-steel Dyneema® line, and attached stuff sacks, you get all the ENO creature comforts in a trail ready package. Add it to your pack and forget it. Eagles Nest Outfitters.